Kolar is located 68 km from the city of Bangalore, on the Chennai-Bangalore National Highway. Kolar boasts of a rich history with the fortresses and temples built under the reign of several dynasties. Someshwara Temple is located in the heart of the Kolar region and is one of the famous temples in this town. The temple was built by the Cholas who ruled this region in the 11th century who were then dethroned by the Chalukyas. The temple was later expanded by the Vijayanagara Empire and is a fine example of the Vijayanagara style of architecture. The carvings on the inner pillars of the temple have an international connection which depicts the importance and value of trade to the King. The temple is every architect’s delight considering the beauty of Dravidian architecture. The huge gopura on the entrance stands testimony to the hand of the Cholas in the construction of this temple. The temple has heavy Prakara walls, a Kalyana Mantapa (Wedding hall), a Mukha Mandapa with massive pillars, a Vasantha Mantapa (Marriage Podium) and a shrine for goddess Parvati Devi. The Kalyana Mandapa has 64 – 16 sided pillars, a few depicting men, riding horses and others represent mythological stories. The carvings on the pillars bear influence of the European, Chinese and Thai style. The Kalyana Mantapa’s top portion depicts a Chinese style of architecture and the temple tower boasts of stucco figures. Apart from this, the Vijanagara inscriptions are found on the walls of the yagashala and temple store room which date back to the 15th century A.D. The door frame of this magnificent temple is carved in pure Vijanagara style with the dwarapalas (guards). There is a granite bull carved at the entrance of the temple. The temple also has a large stepped tank in Vijayanagar style called Kalyani. The Someshwara temple is dedicated to Lord Shiva. He is worshiped in the name of Lord Someshwara at this temple. Kolar is located 68 km away from Bangalore and 35 km away from the Kolar Gold mines. It is well connected to almost all major cities and towns in Karnataka and Andhra Pradesh. The nearest railway station is Bandarpet which is located 15 km away from Kolar and the nearest airport is Bangalore International Airport. The availability of transport makes it easy to reach this state protected temple. Elephants are depicted frolicking, walking, fighting and sometimes hopping over a linga in the basement of the temple. Kolar is almost synonymous with gold; this town has been known for its gold reserves from the 5th century. This town known for its antiquity has witnessed the rule of Cholas, kings of Vijayanagara , Wadiyars, Hyder Ali Khan, Tipu Sultan and the British Raj. You should visit this temple even if you are an atheist, to admire the architectural and artistic amalgamation depicted in this temple. 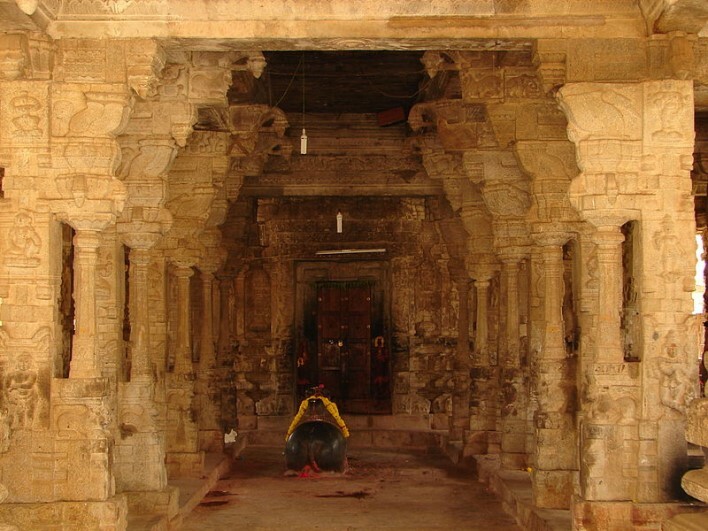 There are several other temples and fortresses that you could visit in and around the town of Kolar. The best time to visit will be December as the climate will be pleasant.